M L 18″ (46 cm) F L 15″ (38 cm). Description: Very long, keel-shaped tail; yellow eyes. 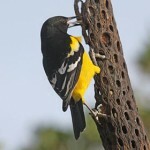 Adult male is glossy black overall with a purplish sheen on head, back, and underparts. Adult female is brown above; cinnamon-buff breast; and grayish-brown belly. Less glossy than male. Juveniles are similar to female but duller and show some streaking on underparts. 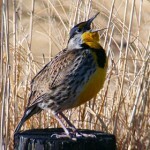 Habitat: Breeding birds are found in a wide variety of habitats usually including both open ground and nearby water. Commonly found in irrigated croplands. Where in Nebraska: Increasingly regular and now locally uncommon spring and fall migrant and local summer resident in southern Nebraska. 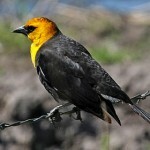 First found breeding in the state in 1977, and northward expansion in Nebraska appears likely. 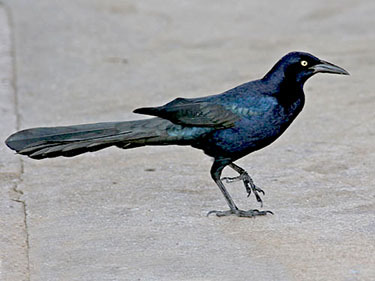 Fun Facts: Great-tailed Grackles are called “cuervo” (meaning raven) in parts of Mexico where there are no crows.